It’s summer, so fuzzy legs/armpits/bikini line is a massive beauty no-no. There are a million and one ways to de-fuzz, many of which I have been experimenting with recently (blogs coming soon!) but without a doubt the quickest and easiest fix is to grab a razor. A razor is just a razor, right – so why bother reviewing? Well, I don’t think all razors are created equal – the difference between a disposable and the ones where you keep the handle and switch the blades is pretty noticeable. I used to always go for the cheap disposable versions – not one to want to spend a chunk of beauty funds on something as ‘basic’ as a razor – but over time I learnt that what I saved in pennies cost me in time spent shaving, nicks and cuts and how frequently I had to go back and do the whole chore again. Gilette are pretty much the creme-de-la-creme of razor makers, with practically so many out there that it’s hard to count. There are one blade, two blade, three blade… and so on… I’m almost surprised there isn’t a double-decker style razor with two layers or razors or one that is the size of a small country boasting 50 razors…. Anyway, I jest – but they do seem to keep upping the number of razors, surely they have reached their limits?? 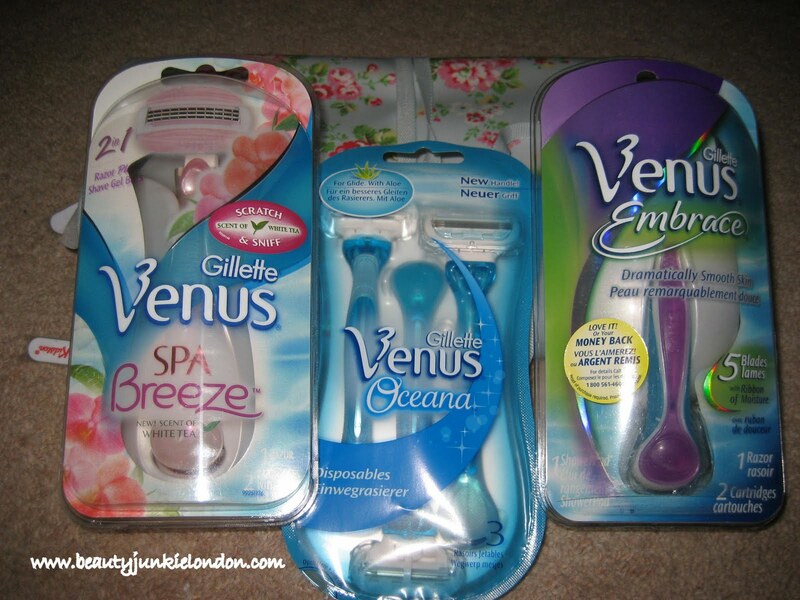 Of the three razors in the picture my razor of choice is the Gilette Venus Spa Breeze – with built in shave gel in the shape of a bar that surrounds the razor. This is quicker and far less messy than the usual lather-up with foam and then shave routine and I think works wonderfully. I know some people feel the bar of shave gel prevents the razor from getting close enough to do a decent job. Personally, I don’t find this at all – but I do have very fine hair, so this might be why. Of the other ones pictured the ones I least like is the Venus Oceana razors – these are the disposable ones and whilst they are *OK* as far as disposables I just think it really is worth spending a few more ££ to get something that is more flexible and will deliver better results but if you are a die-hard disposables fan then there is a lot worse you could buy out there than these. Last but not least is the Venus Embrace with five blades – these are good, they do a decent job and if you don’t like the built-in shave gel version then these are very decent. One plus of these is I feel the blade heads last longer between changes, probably because of the extra blade. So these can be slightly more cost effective than other versions. My pick of these three is the Venus Spa Breeze – I have already bought replacement heads when the ones I was sent ran out. Sent as PR samples for review. i actually use the gillette fusion razor, it’s the men’s one. i’ve got pretty stubborn hair so i need the extra razors :p.
Great review! Thanks for your opinion! I’ve been trying to decide what razor to use. Thanks!